This super lazy King Lion model is great to use in a circus, safari or jungle themed area...or even as something different for your garden. 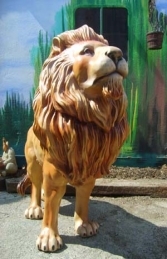 This resin replica male Lion can be used in any Jungle or Safari themed area in adventure golf courses, zoos, theme-parks or to promote shops, businesses, pubs, restaurants, coffee shops. It would even look fabulous in your own home or garden.